Three US Senators and a Representative have reintroduced an act in an attempt to remove perceived barriers placed on US natural gas exporters. Eagle LNG Partners received the Final Environmental Impact Statement (FEIS) from the US Federal Energy Regulatory Commission (FERC) on 12th April. Keppel Gas Pte Ltd (Keppel Gas), a wholly-owned subsidiary of Keppel Infrastructure Holdings Pte Ltd (Keppel Infrastructure), has received its first LNG cargo import under Singapore's Spot Import Policy. 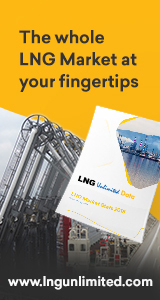 There were several more LNGC contracts reported recently. The Canadian Maritime Simulation and Resource Centre (MSRC) has played a key role in the Énergie Saguenay project, spearheaded by GNL Québec. Golar LNG Limited has received a firm $700 mill underwritten financing commitment for the FLNG ‘Gimi’. GTT (Gaztransport & Technigaz) reported a drop in consolidated revenue of 8.2% for the first quarter of this year. Burckhardt Compression is to fit its patented Laby compressors on 30,000 cu m LNGC newbuilding to be operated by Knutsen OAS Shipping. Wärtsilä and Samsung Heavy Industries (SHI) have signed a joint development project (JDP) agreement aimed at establishing a more efficient solution for LNGCs and shuttle tankers. Russian Maritime Register of Shipping (RS) and GTT have signed a co-operation agreement for LNG transportation. Daewoo Shipbuilding & Marine Engineering (DSME) has held a naming ceremony for four Arc7s at its Okpo Shipyard. On 28th March, DSME christened the new 172,600 cu m LNGCs ‘Nikolay Yevgenov’, ‘Vladimir Voronin’, ‘Georgiy Ushakov’ and ‘Yakov Gakkel’, named after Russian Arctic explorers and scholars. The Arc7s are scheduled to be delivered in October and November, 2019, and January and February, 2020, respectively. They were ordered by Teekay LNG Partners as part of a $4.8 bill contract for 15 icebreaking LNGCs for the Yamal LNG project. Each ship is valued at $320 mill. Thus far, DSME has delivered 10, with five remaining under construction at Okpo. A training programme for seafarers responsible for LNG and other low-flashpoint fuels on board NYK Group-operated ships has been accredited by Nippon Kaiji Kyokai (Class NK). This makes NYK the first Japanese shipping company to obtain an international institution’s certification in the field of IGF Code training, the company claimed. The European Commission has approved plans to increase the regasification capacity, and the development of additional services, at the Świnoujście LNG receiving terminal. The plans would see the terminal capacity increase from 5 to 7.5 bill cu m per year. As a result, Polish LNG will receive €128 million from the European Regional Development Fund and the Cohesion Fund, under the 2014-20 Infrastructure and Environment Operational Programme.